Even more household goods from the UK area. 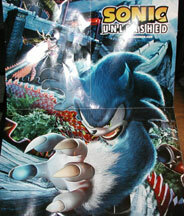 England (where Sonic the Comic originated) has what is probably the largest number of unique posters for your walls, thanks to STC giving them out with issues. 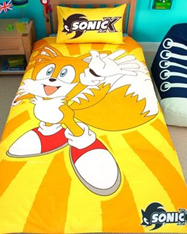 What more interesting items will appear to decorate your home in Sonic Style? Stay tuned on this page. 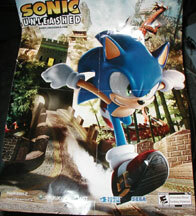 Here's another poster from STC. 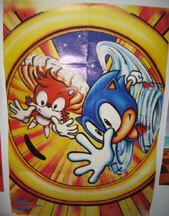 (you can see how it was folded to package it with the comic) This one has Sonic & Tails speeding along, reaching for a ring, which is in the extreme foreground. It looks like it could be in the 'half-pipe' special area of Sonic 2. The art is ok, and fairly typical for the time. 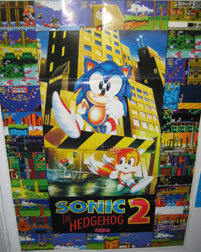 Sega Power Magazine enclosed a Sonic 2 poster in with one of it's issues. Here, an odd scene of Sonic and Tails in a city (there wasn't one in the game) is the centerpiece. Foreword running semi-stock Sonic is shown jumping over a barricade while tiny Tails runs under it. The border is all made up of screenshots directly from Sonic 2. With the colorful shots and unusual art, this is an interesting poster to collect. Photo by Rhia. 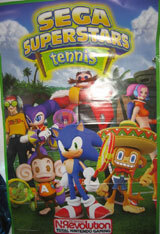 To celebrate the release of Sega Superstars Tennis, N*Revolution magazine enclosed a poster. 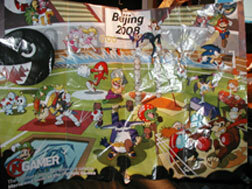 This one is a group shot with most of the characters from the game, headlined, of course, by Sonic. Upon inspection you can also see AiAi the monkey from Monkey Ball, Ulala from Space Channel 5, the Jet Grind/Set Radio guy, NiGHTS (as it appeared in the Wii game) and Amigo the monkey from Samba De Amigo. Eggman is looking smug in the background, though no one would suspect him of wanting to play tennis against people who can fly and run faster than the speed of sound. 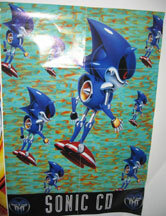 Metal Sonic makes a rare poster appearance. They didn't really do a whole lot with him, just taking the official Japan stock art and spamming the same one all over the poster, but in different sizes. The background is a rather clashy green with orange wiggles. Of course, the stock art of Metal Sonic is great, with smooth chrome effects and very good shading. The most curious thing about the poster is the odd little symbol appearing at the bottom. (Close-up photo above) It's vaguely "Transformers-ish" but really looks like it may mean something...though what isn't known. This is another STC poster. Photo by Rhia. Here's a tall plastic cup, with wrap around design. The whole background is checkered in black and gray. It's pretty old, at 1991, and has a super chubby style jumping Sonic stock art on the front. Look at where they put the line for his back! The back of the cup simply says Sonic and the usual "HWA". This is supposed to have a lid and straw with it, but it is gone. 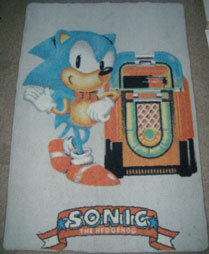 Check this out, a Sonic rug! This is an actual rug for your floor! Talk about adding Sonic detail everywhere. You can see the carpet-like texture to the design. This has Sonic (who is mysteriously wearing a bow tie) learning on jukebox. The art style really resembles the old Japanese screen-saver set of professional artworks which were produced in the early 1990s. With his name on a ribbon like banner image at the bottom, this rug is really all done in classic style! It's also quite rare for some reason. 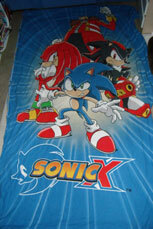 This could be because it is fairly large...and exactly what section in a store might sell you a Sonic rug? This interesting decor item would be a real highlight in a Sonic collection! Photographed and owned by HoggerTheHedgehog. 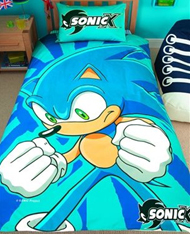 This is a really cool Sonic X themed bed set. It looks like a single, with 1 pillowcase. 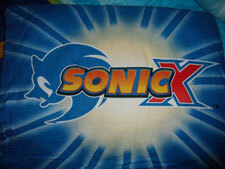 The case has Chargin' Sonic on the front, with the Sonic X logo on the back. 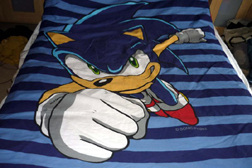 The other part seems to be either a sheet, or a thin blanket of some kind, with part of the cast on the front, and a scattering of Sonic X art and logos for the back. This set is a single-bed type. 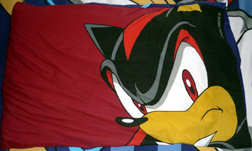 Why they left out Tails and decided to throw in Eggman is a bit of a mystery, but the front of the blanket/sheet still has a good style and isn't too busy like some sets may be. More information on this set is pending. It was imported to the Netherlands. Photographed and owned by HoggerTheHedgehog. Freshen your home or car with this 3D air freshener. While interesting, this item is not common. 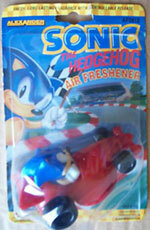 One once sold for $57 dollars over ebay, which is also interesting because it reveals that only Sonic the Hedgehog can make someone spend over 50 dollars for an air freshener. Photo discovered by JordanJ. Here's an interesting item, presumed to be from either the UK or elsewhere in the Europe area. 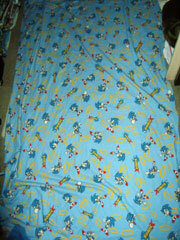 Clearly it is a Sonic X themed cloth of some sort, but what exactly IS it? It could be a towel a sheet/spread, a curtain or something else. This is a single-bed sized Blanket/Duvet & pillow case set made by NEXT. 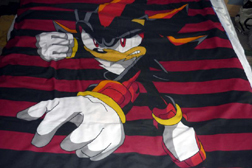 The set's theme is that it's reversible, with Sonic on one side and Shadow on the other. 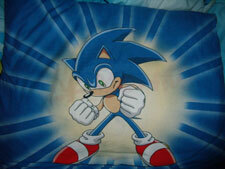 The blanket is reversible...and so is the pillow case! Choose your favorite, or flip it over for variety if you have a single-bed. This is a modern bed set by NEXT. They still haven't given up the "Sonic plays a random sport" which was popular with classic items. Here, it's soccer/football and much more interesting and dynamic than usual. A pretty much new/unused art in Sonic X style is used of Sonic jumping and trying to hit (by hand) a soccer ball. However, it's sort of odd because only the goalie is allowed to touch the ball with a hand in this game. The background is the soccer field, with the striped grass and border lines. The set is supposed to have a pillow case, single bed size blanket, and (possibly/unconfirmed) sheet. Photo by NEXT. This should be available online in summer 2010, in single-bed size only.